Breathing emergencies such as shortness of breath are covered in St Mark James first aid classes, where you will receive “hands on” training and certification. The information posted on this page is for information purposes only. A pocket mask can be used to assist victims with breathing if they are having difficulty and are willing to receive help. Participants signed up for cardiopulmonary resuscitation or first aid training with this provider will learn a number of different self protection techniques. 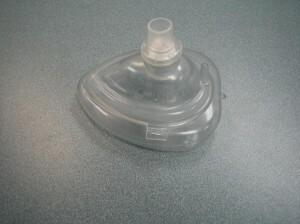 This pocket mask, pictured above, is used a barrier device to prevent disease transmission when providing assisted ventilations. If any of these symptoms appear, the victim is experiencing troubled breathing and should be reported to the emergency room in case of a severe reaction. Severe symptoms include weakness, dizziness and confusion because at this point, the muscles and brain are taxed. The patient shouldn’t speak or move. The more energy he uses in movement and muscle contraction, the more oxygen he will need to fuel them. This will make the condition even worse, because the cause of the problem is the shortage of oxygen in the first place. He may sit upright or lie down; whichever posture is most comfortable will suit best. There are many positions that people are accustomed to that allow them to encourage chest expansion and airflow. Some people sit upright with the hands on their knees to expand their chests. Others may extend their arms overhead to allow unobstructed, maximum air flow. Do not restrict the casualty in a specific position as every person is different and adjusted to a different posture. If you have not called 911 yet or if the casualty has not recovered even after he has allowed himself to become comfortable—for 2 to 3 minutes—call emergency medical help immediately. The symptoms of shortness of breath may aggravate and lead to much more severe complications such as confusion which results in brain damage if not treated. Shortness of breath may be a symptom of another condition, therefore, before things get serious, seeks medical help. Shortness of breath may be caused due to a heart attack or a poisoning such as carbon monoxide poisoning which can lead to death. Calling 911 in such cases is a life and death matter, so act fast! Patients with lung problems often have oxygen available. In case of a shortness of breath episode, allow the patient to use his oxygen as advised by the doctor. Allow the victim to use oxygen for as long as possible or till help has arrived. Shortness of breath may be caused by another complication such as asthma, lung infections or heart disease. Treat each condition by observing the symptoms and linking them to the possible problems that may cause them. Asthma patients may have drugs or an inhaler to treat an asthma attack. Heart disease patients may have nitroglycerin available. Make sure the victim takes medication or uses tools according to the doctor’s prescription. Severe cases such as lung infection, heart attack or problems with prolonged symptoms, will require immediate medical attention so make sure help is on its way.